While I worked a busy shift in the ER today I saw more than a dozen patients with flu symptoms. They complained of cough, congestion, headache, muscle pain, and often, stomach upset. It reinforced the idea that infection and fever are almost always accompanied by a loss of appetite, if not outright nausea and vomiting. In medicine, we use a patient’s ability to eat as an important, but rarely taught, predictor of sickness. This takes the form of the PO challenge. PO stands for per os, meaning by mouth in Latin. During a PO challenge we give a patient food and/or drink. A patient passes the challenge if they are able to eat or drink without vomiting. We use the PO challenge to decide whether a patient is too sick to go home. We are reassured when a patient can eat, and more concerned when they cannot. Was there a large scale medical trial that introduced the PO challenge to the medical community? No, instead this time-honored phenomenon is a medical custom. Even though it lacks a firm evidence base to support it, the PO challenge is useful in emergency medicine. I suspect it tells us something important about the severity of disease. The fact that anorexia, nausea and vomiting are common during acute illnesses, especially during systemic infection, has not escaped the notice of researchers. Recently, Ruslan Medzhitov of Yale University studied whether not eating might be beneficial, or adaptive, in viral and bacterial infection in mice. “Researchers infected mice with either a bacteria that causes food poisoning or a flu virus. All the mice began to eat less after falling ill, but some were force-fed food or given pure glucose. After 10 days all the bacteria-infected mice who had continued being fed had died, while more than half that had avoided food lived. But it was the opposite in those infected with the flu: More than 75 percent lived if they had been force-fed, while only about 10 percent lived if they hadn’t. Food was protective against the virus, but detrimental to the bacterial infection. “To our complete surprise we found that force feeding was protective” in viral infections, Medzhitov said. If Medzhitov’s observations are correct, then it might be dangerous to consume carbohydrates during a bacterial infection. And, it would make sense that bacterial products such as lipopolysaccharide, or LPS, would cause an abrupt loss of appetite. If Medzhitov’s work applies to humans, it would suggest that this loss of appetite is beneficial, for reasons we covered recently in this blog post. One intriguing adaptive function triggered by LPS is that we potentially deprive invading microbes of growth-limiting glucose and micronutrients. At the same time, our bodies continue to nourish protective microbes in the gut. We feed our allies and starve our enemies. Both solid bars (Fut2+) and open bar (Fut 2-) had markedly decreased food intake after LPS. In an important finding these authors also showed that LPS makes the host secrete carbohydrates on the intestinal epithelium. This effect depended on production of fucosylated oligosaccharides, the gene for which is FUT2. 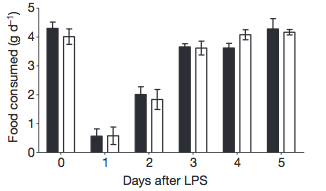 FUT2 positive mice produce these carbohydrates rapidly after stress from LPS with the consequence of directly feeding gut commensal microbiota. Thus, LPS is an agonist for N-fucosylation that has the effect of diverting nutrient energy to commensal bacteria. N-fucosylation benefits the host in this instance by feeding beneficial barrier bacteria. Selection may have favored this mutualism because commensal bacteria help prevent invasion by gut pathogens. This was a mouse study, and humans differ in at least one important respect. Some humans lack functional Fut2, preventing the ability to secrete fucosylated oligosaccharides. Fut2 negative humans are at higher risk of inflammatory bowel disease and neonatal sepsis. Not surprisingly Fut2 in humans shows evidence of ongoing natural selection. But what about our nauseated and miserable flu patients? Humans with viruses stop eating too. Work by Medzhitov in mice, and by van den Brink et al. in humans, suggests that extra nutrition might be helpful in viral infections. Perhaps Medzhitov is correct that the costs and benefits of illness anorexia differ in infections caused by viruses. If so, we should feel validated as doctors by prescribing anti-nausea medications to our influenza patients, encouraging them to eat and drink and showing them out the door. In fact, I did this myself more than once today. I suspect that even if there are different nutritional tradeoffs in viral and bacterial infections, overeating during an acute viral infections could be a problem. Why? Because about one kilogram of bacteria and archaea inhabit our bodies, and these microbes can cause lethal superinfection after influenza strikes. The microbiome might be considered a low grade chronic infection – one that never is entirely cured – that poses a existential threat to us. This threat becomes real after severe viral infection, trauma, or critical illness. John Alverdy has a term for this: the Pathobiome, which is the pathologic transformation of the microbiome. If the pathobiome is a source of sepsis as Alverdy proposes, then feeding as usual is simply dangerous during a case of influenza. To recap, sick patients, whether infected by virus or bacteria, stop eating. The sickest ones won’t tolerate food, even when encouraged by family or by medical professionals. And we will go on using the PO challenge to determine whether it is okay to send our infected patients home. How we identify adaptation during infections and critical illness is a question we will explore this summer in Park City Utah at the 4th annual meeting of ISEMPH – The International Society for Evolution, Medicine and Public Health. Registration and abstract submissions open soon! Another very good blog! It is amazing how close to home this hits to my commercial animal nutrition practice. Strategies to avoid growth and feed conversion losses in baby pigs is a major game we play that affects the health of the entire herd. The period of time that a baby pig spends in the nursery-from about 15 pounds to 40 pounds-will determine how well the animal will do or perform the remainder of it’s life. It has been documented that under commercial conditions a group of baby pigs will have as many as 5 or 6 separate low-level immune challenges in the nursery that result in some degree of inflammation-and this is in addition to serious immune challenges that often occur. Immune challenges are very costly in terms of loss of growth and feed conversion for the group. We try to construct diets that will cooperate with the needs of the baby with as little conflict as possible although it is not described this way. One of the ways we try to maintain resource cooperation is to only use lactose as a sugar and energy source in our baby pig diets. University studies utilizing different sugar sources (glucose, sucrose, high-fructose corn syrup, by-product candy and lactose to name a few) have shown numerous times that there are no statistical differences in sugar source on performance and therefore many nutritionists use these products interchangeably in their diets. However, the University trials are conducted in relatively clean and sanitary conditions compared to real-life commercial conditions. As you would expect; when we only use lactose, animal performance on the farm is superior to the other sources. This fits your cooperation and conflict theory very well. When antibiotics were allowed, it was very hard to make these observations. One of the problems in animal nutrition-which is based on the use of by-products-is that almost everything we have in these diets can be viewed as a resource conflict. In many ways it is similar to the resource conflict problems of modern human diets. As usual, Fred, you raise very interesting points. I think we have a lot to learn from the animal nutrition literature! Not everything will translate to humans, and there are good evolutionary reasons for that. But the principles that underlie conflict/cooperation between host and microbiome play out similarly in a variety of species.